The 3D Cell Transfection Kit is the first and unique in vitro transfection technology which allows researchers to achieve high delivery efficiencies of plasmid DNA into 3D cultured cells. 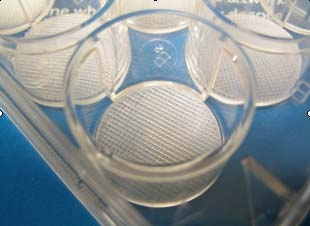 This innovative product includes a sterile plate containing 3D Cell Culture Scaffolds (3D Biotek, LLC) and a 3D Transfection Reagent (BioCellChallenge SAS). With this kit, researchers can now perform extended transgene expression time-courses in a physiological-like cell growth environment. 3D Cell Transfection Kit for 24-well plate contains: 12 polystyrene scaffold, 3D Insert-PS (ref. PS152024-12) - fiber size ~150 µm, pore size ~200 µm 200 µL of 3D Transfection Reagent (ref. 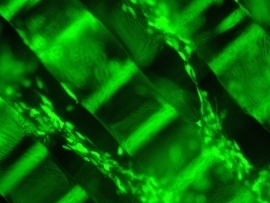 TDG200 http://www.biocellchallenge.com/). 3D Cell Transfection Kit for 96-well plate contains: 24 polystyrene scaffold, 3D Insert-PS (ref. 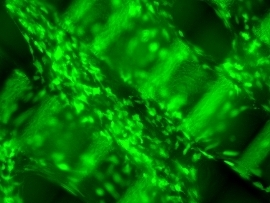 PS152096-24) - fiber size ~150 µm, pore size ~200 µm 100 µL of 3D Transfection Reagent (ref. TDG100 http://www.biocellchallenge.com/).